Tauy Creek: 1231: "Hey, Gladys, Come Play My Flute!" As you may know, the macaroni referred to in "Yankee Doodle Dandy" is not the pasta but a fashion statement of the late 1700s and early 1800s. The macaroni fashion refers to giant, outlandish wigs and clothing. In fact, based on historical research, macaronis are the precursor to dandies, fops, hipsters and metrosexuals as all of these representations care about their appearance and could all be considered slightly effeminate. 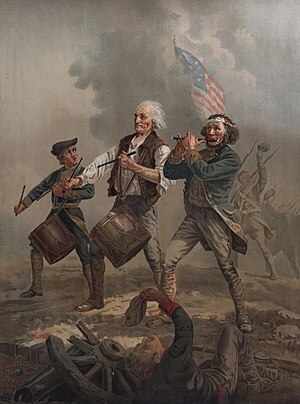 As for the song, "Yankee Doodle", the term was included as joke. The author, noting what the Colonists were wearing during the Seven-Years War, was making the commentary that the Colonists could stick a feather in their caps and deem it sufficient fashion. In today's strip, Brutus is just drunk. The Spirit of '76 by Archibald MacNeal Willard (1875). Photo from Wikipedia.